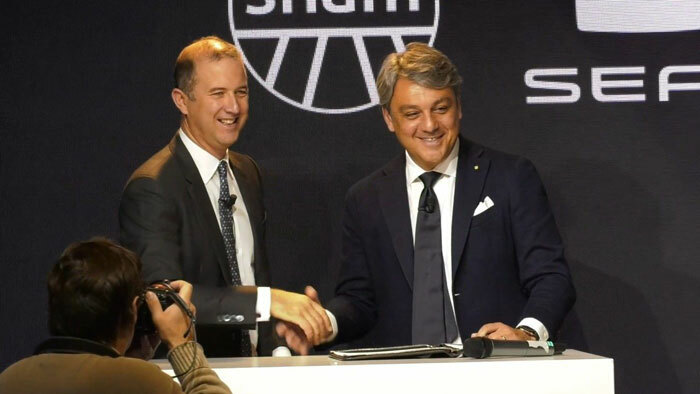 SEAT President Luca de Meo and Snam CEO Marco Alverà have signed a strategic agreement in Milan, Italy, to promote the use of compressed natural gas (CNG) and renewable gas (biomethane) for sustainable mobility, as well as joint research and development projects in this scope. SEAT, S.A., a Spanish automobile manufacturer, and Snam S.p.A., an Italian natural gas infrastructure company, share strategic markets such as Italy, France and Austria, which will enable the creation of synergies to boost CNG and bio-CNG as a clean and competitive alternative to traditional fuels. In addition, SEAT and Snam will collaborate in developing mobility services and creating new products, with the goal of offering added value to users of these kinds of vehicles. The strategic agreement, which could extend to other Volkswagen Group brands, also includes the technological development of biomethane, a renewable energy that helps reduce emissions even more. “This partnership will strengthen the development of natural gas and biomethane-powered sustainable mobility, both in Italy and across Europe, combining Snam’s innovative infrastructure development, and SEAT’s expertise in rolling out new sustainable models,” said Alverà. There is an upward trend in the use of compressed natural gas cars in Europe. Italy is the main market with a fleet of approximately one million vehicles and 1,300 refuelling stations. SEAT is committed to CNG as an efficient, profitable alternative. The brand currently offers compressed natural gas and petrol hybrid technology with the Mii, the Ibiza, the Leon and the Arona, the only CNG SUV in the world. Driving with CNG emits 75% less nitrogen oxide compared to a diesel vehicle and 25% less CO2 than one that runs on petrol, and it does away with practically all particulate matter. Mobility with vehicular natural gas is considered environmentally friendly by the European Union, so the benefit of this kind of fuel includes the possibility of accessing European cities when there are traffic restrictions due to pollution. Besides contributing to the fight against climate change, natural gas also ensures significant economic advantages to consumers, as it enables savings of more than 30% per kilometre compared to diesel fuel and more than 55% in the case of petrol. Tags: biomethane,CNG,compressed natural gas,renewable gas,SEAT,Snam S.p.A.